You know the Southwest Chicken Pasta Salad recipe I posted last week? The recipe that I am completely in love with? Well, it showcases the chicken from this burrito bowl recipe I got off of Iowa Girl Eats. And just like with the pasta salad, the chicken is the star of the show. It will make you so happy you won't know what to do with yourself! Oh and did I mention how delicious the beans and cilantro-lime rice are, too?? The combination of all the flavors going on in this burrito bowl are incredible. It's so refreshing yet filling and there are SO many possibilities with toppings. In other words, you will NOT be disappointed and you really should make this as soon as possible. It will brighten your day. I promise. 1. Mix the seasonings together in a small bowl and set aside. Place chicken pieces in a separate bowl and combine with olive oil. Stir in enough seasoning mix until chicken is well seasoned; reserving 1 Tbsp. of seasoning for beans. 2. Heat a pan over medium-heat and cook chicken 3-4 minutes per side until no longer pink. Remove from heat and set aside. 4. Add black beans to a small saucepan with water and 1 Tbsp. seasoning mix. Bring to a boil then reduce heat to low to stay warm. 5. 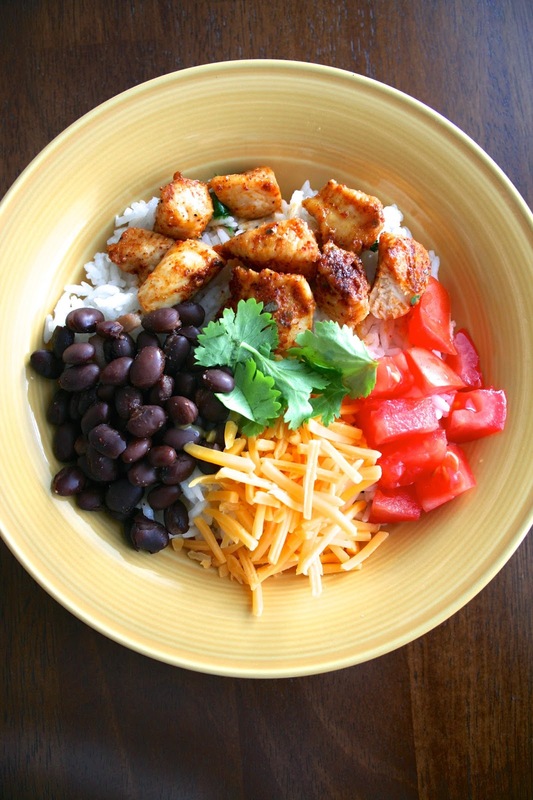 Scoop cooked Cilantro-Lime Rice into bowls then top with grilled chicken, seasoned beans, cherry tomatoes, shredded cheese and other toppings if desired.